"The Big Bang" may well have been the best season finale in Doctor Who's long history. It sparkles with great moments and lovely performances. Except that there were two things in it that bugged the hell out of me. Spoilers! Okay, so first I'm going to explain why I loved "The Big Bang" and found it probably superior to outings like "The Parting Of The Ways," "Doomsday" and "The Last Of The Time Lords." And then I'll get into the two things about this episode that seriously annoyed me and threatened to drag the whole thing down. That way, those of you who prefer to read a purely upbeat recap can have a jumping-off point. So as "The Big Bang" begins, the crack we saw in the wall of little Amelia Pond's bedroom has gotten a lot hungrier, and it's gone and swallowed the whole universe. We've known what caused the crack since the Silurian two-parter — it was the Doctor's time machine, the TARDIS, blowing up and shredding the fabric of space/time — but now we understand a bit more about what the crack really means to Amy. It's taken away her parents. It's swallowed up her soon-to-be husband. It's left her an isolated, cynical misfit whose only meaningful relationship is with her childhood imaginary friend, the Doctor. She's forgotten everybody else she ever loved, and that's before she gets killed. And yet — the crack has also left Amy with an amazing power of remembering. As the Doctor points out, all of space and time was pouring through her head as she slept in that bedroom for years, and it's given her a certain amount of power over reality. (Sort of like what happens to Rose in "The Parting Of The Ways," if you think about it — except not all at once, and not quite so apotheosis-y.) Amy has to choose between the cynical loner she's become and the love that she only half-remembers, which the crack has taken from her. Obviously she chooses right, or we wouldn't be beginning to speculate about Doctor Who season six. So in a sense, "The Big Bang" is the story of Amy's power of remembering, and how it saves everyone. The little girl Amy remembers the existence of stars, and the universe beyond our lonely heliopause, when everybody else has just taken it for granted that stars never existed. Otherwise, Young Amy wouldn't be willing to follow the trail of hints the Doctor leaves for her, to the museum. And Older Amy manages to bring back, first Rory and her parents, and then the Doctor, from oblivion simply by remembering them. As for Rory, he makes the most romantic gesture in Doctor Who history, volunteering to stick around and guard the Pandorica while Amy's inside it for two thousand freaking years. Probably the Doctor's right and nothing bad would have happened if Rory just took the quick way forward to the 1990s. But really, Rory's decision can be seen as the ultimate expression of love, as well as harkening back to a classic Doctor Who motif: the person who was lost his/her humanity making a dramatic gesture to reassert or reclaim it. It's a big soppy romantic notion, and it finally made me fall for Rory. It'll be interesting to see Rory and Amy traveling with the Doctor as newlyweds — now that Rory and the Doctor are now definitely no longer even remotely "competing" for Amy, and Amy is no longer the snarky orphan who doesn't count on anybody to be there for her, the dynamic should be quite different. Surprisingly for a story in which the entire universe has already been eaten and the Earth's sun is actually a TARDIS exploding in slow motion, and the Doctor appears to die and later faces erasure from history, "The Big Bang" manages to keep a light, breezy tone throughout. And a lot of the credit for this must go to Matt Smith and his amazing fez. Not to mention the mop. Smith's Doctor is shaping up to be the funniest incarnation since Tom Baker, maybe even since Patrick Troughton, and best of all, the comedy feels unforced. After a solid year of David Tennant being mopey, a Doctor willing to go into extinction with a manic grin and a fez feels like a welcome change. The biggest threat for most of last week's episode was a half-dismantled Cyberman, and that worked so well Moffat repeats the trick here, with a half-petrified Dalek. And the idea works just as well the second time. It's like a law of the universe: One Dalek is an insurmountable threat, a thousand Daleks are just a minor irritation. Of course, this Dalek winds up being petrified in both senses of the word, when River Song gets her hands on it. And once again, River Song is magnificent. The Doctor's life is clearly richer and more complex for having her in it, and she's shaping up to be a sort of anti-companion in the same way the Brigadier and Captain Jack were. She's not someone who travels with the Doctor full time, she's someone who's in his life, on and off for years, and he keeps coming back to her. And meanwhile, she's off living her life and being fabulous. Of course, it seems like next season we'll get the answers to the River mystery, but in some ways I hope we don't get too much explanation that negates the "she's someone cool who's in his life"
So yeah, this wasn't a slam-bang millions-of-monsters conclusion like "Journey's End" or "Doomsday" — the closest we got was the Legion of Evil in the penultimate episode, although the LoE mostly just stood and speechified instead of whizzing about. Moffat told us up front that this season would be a fairy tale, and so he gives us a fairy-tale ending: There is a test, and the good wizard sacrifices himself, and true love wins, and there's a wedding, and the little girl's power of remembering saves the day. And it must be said: Amy's wedding? So much better than Donna's. So I know that fairy tales don't have to have morals — that's a myth that was imposed, sometime in the nineteenth century, if memory serves — but I'm still left wondering if this one had a moral. Maybe that Rory, the guy Amy sort of took for granted, was the true prize all along? Or maybe that believing in childhood fancies when you reach adulthood can save you from ultimate emptiness? I have a feeling I will be puzzling over it for some time to come. All in all, then, this was a more low-key, but also more fulfilling and cohesive, season ending than the ones we've seen in years past. And nobody who's been following the saga of Rory and Amy could fail to be moved by seeing them reunited and actually honest-to-gosh married at last. And the bit where Amy says "You are LATE for my wedding-ah!" And you think for a moment it hasn't worked, and everybody's just staring at the crazy lady? Pure brilliance. But there are two things that seriously bug me about "The Big Bang," and here they are. If you only wanted to read a totally positive recap of the episode, or you have a philosophical objection to the idea of punching holes in a piece of television that's ostensibly just for kids, do yourself a favor and stop reading now. Last chance! 1) The resolution of the cliffhanger. Seriously, it's lazy, cheap writing. You don't trap the hero in an inescapable trap, and then have him escape thanks to a cheap gimmick. This is the Doctor we're talking about — he ought to have seen this trap coming, and put an ace up his sleeve somehow. He should have out-thought all his enemies, in some genuinely clever way. Instead, we got the cheap timey-wimey solution, with the future Doctor coming back in time to save his past self. Which is nonsensical, if you think about it for more than five seconds. Let's be clear: This is not a time paradox. A time paradox is when you go back in time and kill your own grandfather as a baby. A time paradox is where there's a perfectly logical thread, which then leads in an impossible circle. What the Doctor does to escape the Pandorica is more like this: I, Charlie Jane Anders, do not own a time machine. I have no idea how to build a time machine. Nor would I possess the materials to build one if I knew how. So time travel is impossible for me, right? But wait — what if my future self comes back in time from a point after I've already built a time machine and gives it to me? Then I'll have a time machine, without ever having to build one first. Right? 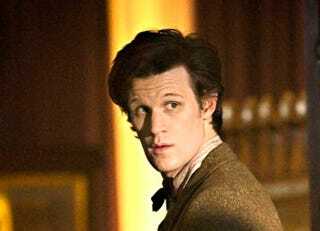 If, as we've been told, it's impossible for the Doctor to escape from the Pandorica, then the Doctor who comes back in time is from an impossible future. It's a future that cannot exist — until the Doctor somehow escapes from the Pandorica. So no. This isn't a time paradox. It's just lazy, cheap writing. Even Russell T. Davies, master of cheap tricks, wouldn't have had the nerve to pull this one. 2) One of the season's central mysteries was a bust. I really thought Steven Moffat had something cool up his sleeve here. I suspect he thought so too, but then he ran out of time. Or he couldn't make it work for some reason. Somehow, it seemed to go a bit wrong. Let me explain — I am sure it's entirely possible that Moffat always intended to leave the explanation of who the Silence was, and how the Silence managed to control the TARDIS and make it explode, for next year. That's entirely possible. But the question that really bugged me was: Why Amy's wedding day? Why was that the day when the TARDIS explodes? Is it just a coincidence? If so, it's kind of a huge, weird one. You're getting married in the morning. (Realizes) In the morning... It's you. It's all about you. Everything... Amy Pond. Mad, impossible Amy Pond. I don't know why, I have no idea, but quite possibly, the single most important thing in the history of the entire universe is that I get you sorted out right now. And by sorted out, he apparently means fixing things with Rory, since the next thing he does is to take the two of them on a pre-wedding trip to help them bond. As if their wedding is intimately linked to the explosion. So I felt as though the fact that the explosion happens to take place on Amy's wedding day turned out to be a giant red herring. Or maybe it'll be explained next year? I have a sinking feeling it won't be. No doubt, we'll get an explanation of "the Silence," and how they caused the TARDIS to explode. But not why this particular date was significant. As the Doctor himself says, "Never ignore a coincidence." Unless you're in a hurry, in which case always ignore a coincidence. And I have a feeling that this is a story idea that got away from Moffat. He had some vague idea of what would happen at Amy and Rory's wedding to cause an explosion that cracked the entire universe, and then he couldn't make it work for some reason. That's what my gut is telling me. Either that, or it was a really clumsy misdirection. Either way, in the end, it seemed like the explosion could have happened on any day in 2010. Maybe it has to happen at Amy's house, because the crack starts there. But the date? Not important, after all. The reason this second one bothers me so much is because it makes the overall arc of the season feel even more sketchy and haphazard than it already was. And that, in turn, bothers me because so much of the season only holds up as part of the arc. The most glaring example of this of course, is the "Time Of Angels"/"Flesh And Stone" two-parter, which basically gets swallowed up by the crack about halfway through the second episode. But there have been at least a few other times when I've gotten the feeling that Moffat was more interested in the Crack meta-story than in the stories of individual episodes. Of course, when we get our answers as to who/what The Silence is, next year, I may be forced to eat my words. Here's hoping that comes to pass.